Nepal's openers walk out to the middle. Image - @EmiratesCricket/Twitter. Nepal clinched the three-match ODI series 2-1 after securing a four-wicket win in Dubai on Monday. 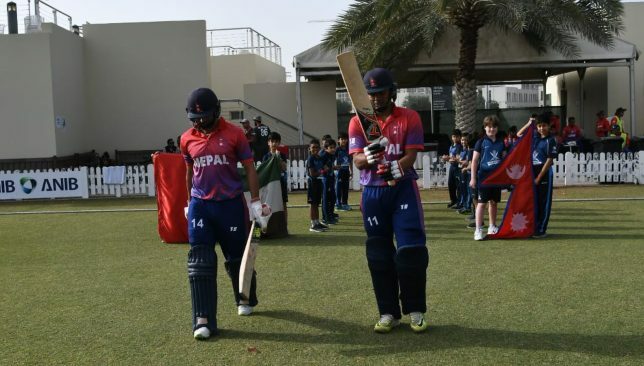 Hosts UAE set Nepal a target of 255 to win at the ICC Academy. Led by half-centuries from Shaiman Anwar and Mohammad Boota, UAE recovered from a poor start to ultimately post 254-6 in their 50 overs. Anwar scored 87 while Boota remained unbeaten on 59 (31) as the hosts collected 114 runs from the final 10 overs. In reply, Nepal lost opener Binod Bhandari early with Mohammed Naved picking up his wicket. Captain Paras Khadka rose to the occasion, hitting a fine century to help chase down the target. Nepal reached 255-6 in the 45th over. 100 up for Yuzvendra Chahal and Kuldeep Yadav. 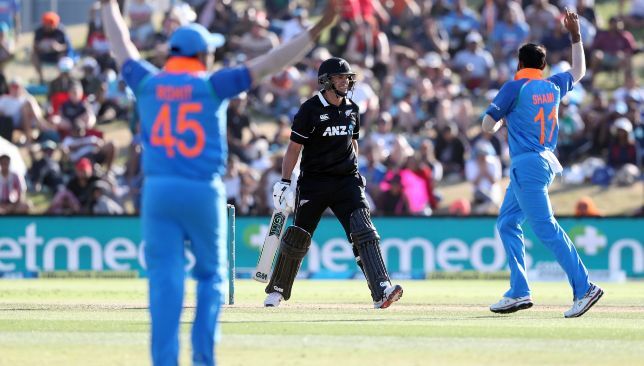 India clinched a series triumph against New Zealand in some style as the Men in Blue secured an unassailable 3-0 lead thanks to a seven-wicket win at Mount Maunganui. The visitors were on song once again as they bowled out the Kiwis for just 243 runs before coasting to a comfortable chase with seven overs to spare. At the end of another dominant display by Virat Kohli and his men, we take a look at the key talking points from the clash. New Zealand put up a much better showing compared to the first two ODIs but it was still not enough with the hosts being bowled out before the completion of 50 overs for the third time on the trot. The openers fell cheaply once again while skipper Kane Williamson failed to get going after a splendid catch by Hardik Pandya. 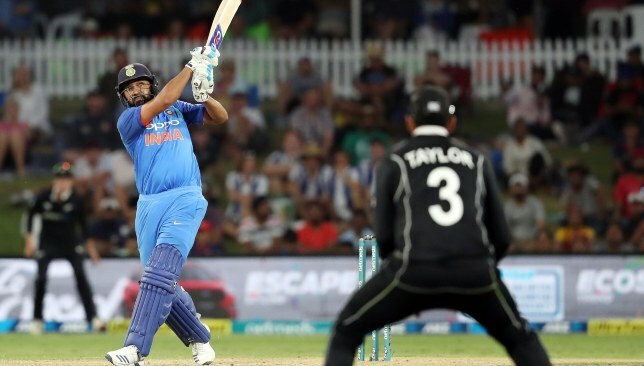 Half-centuries from Ross Taylor and Tom Latham looked to have put the Kiwi innings back on track but they once again faltered at the death after some impressive bowling by the Indians. Taylor was unfortunate to miss out on a ton but the New Zealand innings fell away quickly post his dismissal with Pandya picking up two wickets on his return to the side. Credit has to be given to India’s bowling unit though, who have picked up all 30 wickets on offer so far in the series despite missing the services of No1 ranked Jasprit Bumrah. Another dominant bowling display by India. India’s wrist-spin duo of Kuldeep Yadav and Yuzvendra Chahal had been prolific in the first and second ODIs but it was the pacers who took the limelight on Monday. Kuldeep failed to dismiss a single batsman in his eight overs but Chahal continued his wicket-taking form with two scalps. He got the big scalp of Williamson before returning to break the 119-stand for the fourth wicket by getting the better of the well-set Latham. Chahal’s two wickets brought up a century of dismissals between the wrist-spin pair in the ODI format. The two have established themselves as India’s first-choice spinners in the format since their defeat to Pakistan in the 2017 Champions Trophy final and their wicket-taking form augurs well for the team ahead of the 2019 World Cup in England. A total of 243 was not likely to seriously test the formidable Indian batting line up with the top-order setting up a comfortable chase. Shikhar Dhawan started briskly in the chase but despite his dismissal for 28, Rohit Sharma and Virat Kohli ensured that India’s innings remained on course with a solid partnership. The duo barely looked under any threat as they brought up a 100-run stand between themselves. The skipper and his deputy were in utmost control and brought up their respective half-centuries in the process. The half-century would have come as a relief for Kohli who was dismissed in the 40s in his last three ODIs and will now return home to India for a well earned break. By the time the duo was dismissed in quick succession around the 30-over mark, they had already laid the foundation of a comprehensive win and Ambati Rayudu and Dinesh Karthik duly finished that job without really breaking a sweat. Rohit was in imperious touch once again for India. Hardik Pandya's return to the ODI side was a strong one. 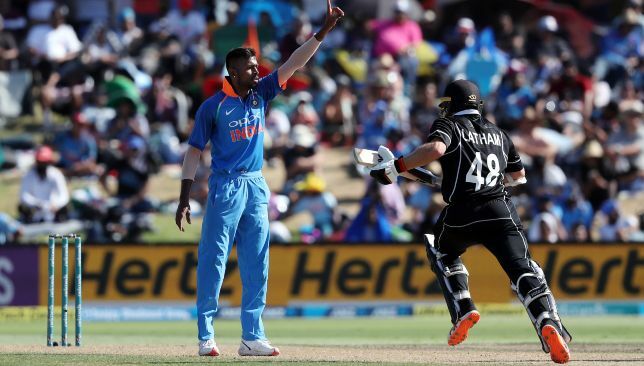 Hardik Pandya made his much-awaited return to the India squad following suspension with a vital contribution in the side’s seven-wicket win over New Zealand in the third ODI at Mount Maunganui. Having sat out the ODI series against Australia following controversial remarks made on a television show, Pandya was back in full flow against the Kiwis producing a superb return. The all-rounder picked up two wickets with the ball while also pulling off a blinder of a catch. Here, we take a closer look at his display in the third ODI. Pandya provided India with the third seaming option with Bhuvneshwar Kumar and Mohammed Shami taking the new ball. Brought on as first-change, the all-rounder started well with the ball and made run-scoring difficult for the batsmen in an economical first spell. His second spell was even better with Pandya returning towards the death to pick up the wickets of Henry Nicholls and Doug Bracewell. 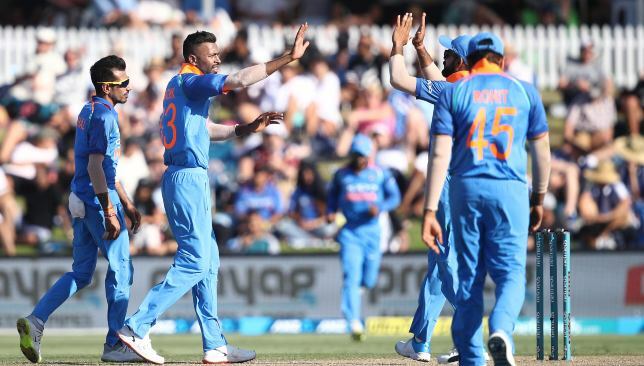 Apart from an excellent bowling performance, Pandya was impressive in the field as well where he completed a stunning catch at midwicket to bring an end to Kane Williamson’s innings. A fine bowling display from Pandya. The 25-year-old did many things right on Monday but his ability to keep thing tight was the most pleasing aspect. The all-rounder can leak runs at times but he displayed good control against New Zealand’s best batsmen in Kane Williamson and Ross Taylor and restricted them from scoring freely. 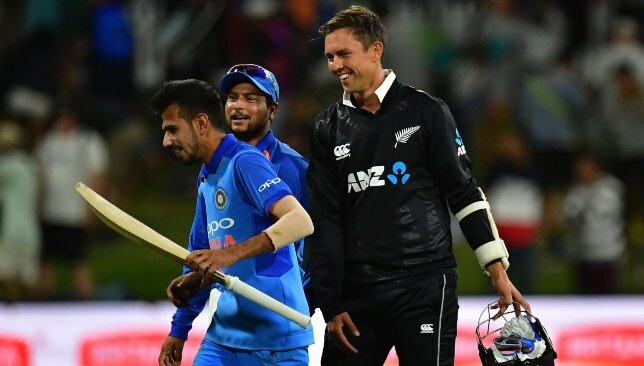 Pandya got it spot on in his second spell in the death as well and his dismissals of Nicholls and Bracewell in quick succession halted New Zealand’s momentum and prevented them from going big in the final overs. However, his most important contribution might have come through his spectacular catch to dismiss Williamson with the New Zealand skipper always capable of the big innings. Hardik Pandya proves his worth on team with a superb catch of the day. There was not much wrong to pick from in Pandya’s performance in the third ODI. His bowling can be wayward at times but on Monday he looked extremely focused and disciplined with the white-ball in hand. In the past there have been plenty of occasions where Pandya has not been able to finish his quota of 10 overs due to his economy-rate but that wasn’t an issue at all at Mount Maunganui. His time away from team seems to have done him a world of good with regards to his concentration and that can only be a good thing for India. The balance Pandya brings to the Indian ODI side was for all to see and as such, his return will be greatly welcomed by the team management as they look ahead to the World Cup. A seaming all-rounder will be crucial on England pitches and with Pandya in the side, India can freely play both Kuldeep Yadav and Yuzvendra Chahal who have developed into a prolific wicket-taking duo. While Pandya did not get a chance to bat, his explosive hitting lower down the order will certainly bring the X-factor to the squad. With his impressive display with the ball and in the field, the all-rounder has wasted no time in reminding the team management of his prowess and it will now be a question of maintaining this form for the next few months.